Located just north of the City of Davis, Woodland is home to an impressive stock of historic resources, an active farming and industrial economy, and excellent regional access to the Sacramento area. 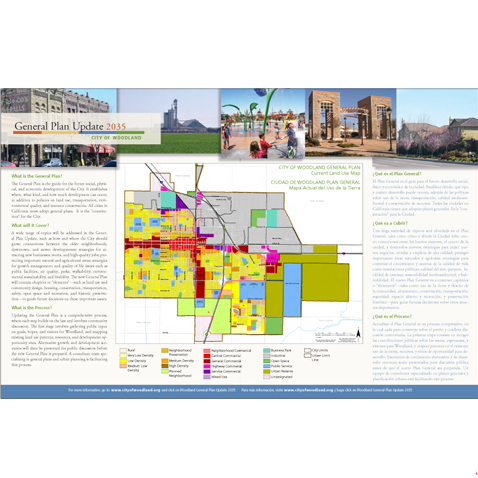 The General Plan Update is the first opportunity in nearly 20 years for Woodland residents to establish a community-wide vision for the city and priorities for its future growth and development. The Dyett & Bhatia team will also prepare the city’s first Climate Action Plan, which will serve as a qualified greenhouse gas reduction strategy. A robust public engagement process is underway, with interviews of key stakeholders, multiple visioning workshops, and a bilingual newsletter and mail-in survey sent to every household in the city providing a variety of avenues for the public to get involved in the process. Technical research and analysis has been completed, and Guiding Principles endorsed by the City Council. Preparation of alternatives is underway.